How many chickens do you think you have and how many for each purpose? 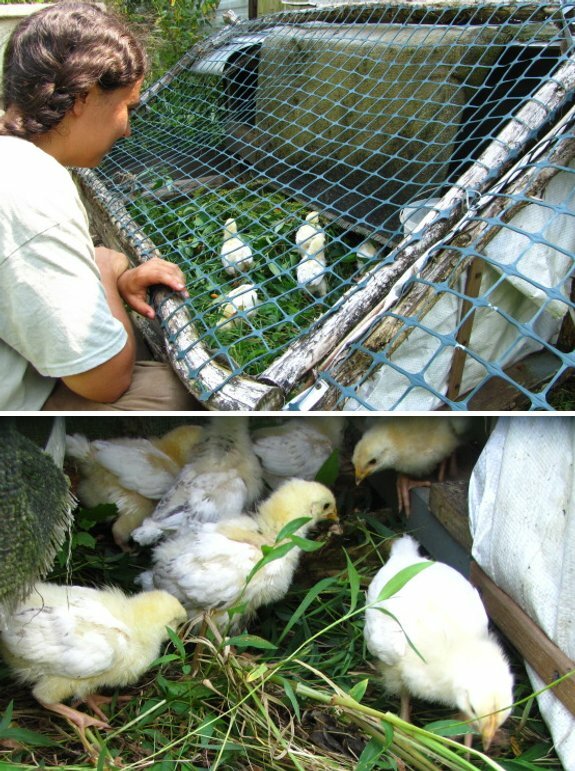 14 Light Sussex chicks (two weeks old). We'll keep three hens and maybe a rooster to be in our permanent flock. 8 Black Australorp pullets and cockerels (three months old), of which we'll be eating 7 this week and keeping one rooster. 1 Turken cockerel, the same age as the above, slated for the freezer. 3 Cuckoo Marans pullets (four months old) to be laying and brood hens next year. 3 Black Australorp pullets (five months old) to be laying hens next year. So, to answer your question, we currently have 29 chickens, most of which are meat chickens. We'll be going into the winter with ten or eleven chickens. That's really too many for us, but I want to give several breeds a real try before culling the flock down, and we're sick of buying eggs.